In just the last year, Somali pirates have extorted, in ransom, some $100 Million from ocean going shipping companies. The insurance costs for global shipping at sea is also up. Now, many nations believe it is time to chase the Somali pirates down even when they hide ashore…. The U.N. Security Council voted unanimously Tuesday to authorize nations to conduct military raids, on land and by air, against pirates plying the waters off the Somalia coast even as two more ships were reportedly hijacked at sea. The vote represented a major escalation by the world’s big powers in the fight against the pirates, who have disrupted commerce along one of the world’s most active sea routes and acquired tens of millions of dollars in ransom. It came as China — which has had several ships commandeered in recent months — said it is seriously considering joining U.S., European and Russian warships policing the region. The U.S.-drafted resolution authorizes nations to “use all necessary measures that are appropriate in Somalia” in pursuit of pirates, as long as they are approved by the country’s transitional federal government. The resolution also urges states to deploy naval vessels and military aircraft to carry out the operations, and it calls for the creation of a regional office to coordinate the international effort. The United Nations Security Council has unanimously approved a US resolution allowing countries to pursue Somali pirates on land as well as at sea. It is an extension of the powers countries already have to enter Somali waters to chase pirates. Countries will need the permission of the transitional Somali government. 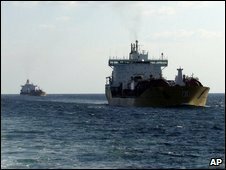 It comes after two vessels were seized by suspected Somali pirates off the coast of Yemen, adding to the dozens of ships hijacked in the area this year. It is the fourth resolution approved by the council since June to combat piracy off Somalia’s coast. It gives authority for one year for countries to use “all necessary measures” by land or air to stop anyone using Somali territory to plan, help or carry out acts of piracy and armed robbery at sea. The US-drafted resolution was co-sponsored by Belgium, France, Greece, Liberia and South Korea. Indonesia, which also suffers from piracy, was among critics of the plan as it feared the precedent it could set for chasing pirates on land. However, it voted in favour of the resolution.